Biologists capture island foxes annually to count them and to evaluate the health of individuals and the population as a whole. Because not every island fox is captured each year during the annual trapping, those that are caught provide a representative snapshot of the general health of each islands' fox population. The first time that an island fox experiences an annual health check it receives a microchip so that it will be identifiable as an individual for the rest of its life. 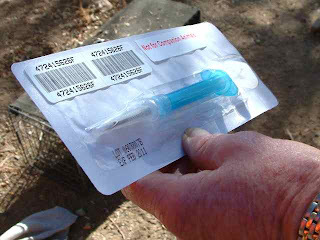 The microchip or PIT (passive integrated transponder) tag is inserted under the skin between the shoulders using needle and syringe. When a young island fox, like Tani, receives a microchip it means that the story of her life will be documented from a young age through adulthood. If she is caught again next year, biologists will be able to determine how far she has moved from her parent's territory. Looking at the data that has been collected on the recapture of island foxes over the years, biologists see a pattern of young male island foxes traveling a great distance from the area where they were born. While female pups tend to stay in areas adjacent to their parents. The first year of an island fox's life can be perilous as they head out on their own into unknown areas. Microchips also allow the identification of individual island foxes if something happens to them. In the past month, two young island foxes have been hit by cars along roads on Catalina Island. Watch for Foxes. 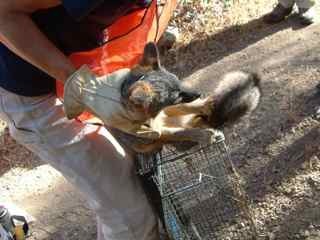 Radio tracking collars help to monitor the movements and health of island foxes, but not every island fox will receive a $250 radio collar. Every island fox that is captured for the first time during annual counting and health checks does receive an identification microchip. You can help support an island fox Health Check for just $25. As island foxes continue their successful recovery from near extinction, monitoring their populations takes on greater importance. Through your donation to Friends of the Island Fox you can help support the recovery of the endangered island fox. How Do You Count Island Foxes?